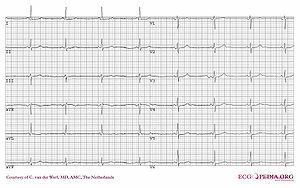 The ECG of the same patient with CPVT during exercise. Asterisks mark polymorphic ventricular beats. 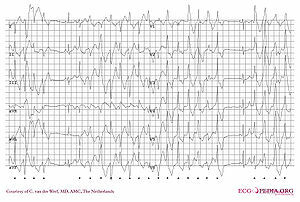 Catecholaminergic Polymorphic Ventricular Tachycardia is a congenital disease that leads to exercise induced ventricular arrhythmias and / or syncope and carries an increased risk of sudden death. The diagnosis is based on the patient's clinical history (dizziness or syncope induced by exercise or emotional stress and a family history containing syncope or sudden death in young relatives related to similar triggers) and reproducible ventricular arrhythmias during exercise testing. The complexity of these arrhythmias often increases with increasing work load, starting with Ventricular Premature Beats, and ending with bidirectional ventricular tachycardia to polymorphic ventricular tachycardia. ICD (Internal Cardioverter Defibrillator) implantation combined with beta-blockers in CPVT patients who survived a cardiac arrest or patients with syncope and/or documented sustained ventricular tachycardia despite beta-blocker therapy. This page was last edited on 17 April 2011, at 20:59.